Our Seattle/Eastside customers can visit our retail store to browse and explore our unique selection of gifts and to see what's new! 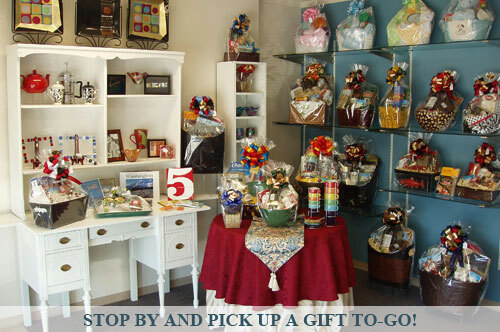 Make your gift selections in person rather than on the telephone, by fax, or our Web site. In a hurry? Our shelves are filled with lots of fun gifts ready-to-go. Personalize your gift by stopping in to sign a card or to drop off your own card to be included in your gift! Celebration Gift Baskets is located at 12727 Northup Way, Ste. 7, Bellevue, WA 98005-1917. Plenty of free parking!